Fingertec H2i and m-Kadex terminal does not come with a LCD screen thus some settings needs to be set with caution. After the registration of the administration card is done, enrollment, deletion or resetting on the terminals cannot be performed by anyone without the administration card. In any case whereby the employee has misplaced their admin card, you can reset the admin directly from the hardware as well as via our software. Do take note that for H2i terminal, User ID 1 is reserved for Administrator. You can refer to the respective terminals’ manual below for steps on how you can reset the terminal to factory settings without the administrator card. However, do take note that once your device has been reset to default factory settings, all contents of the terminal will be deleted including the administrator card, user information and transaction logs. All settings will return to the default settings. The IP address will return to 192.168.1.201, and terminal ID will return to 1 after the process. Proceed by re-enrolling the administrator. 1) Add the terminal to TCMSv2 and enable the device. Once it is enabled, proceed to click at the Advanced Settings of the Terminal. 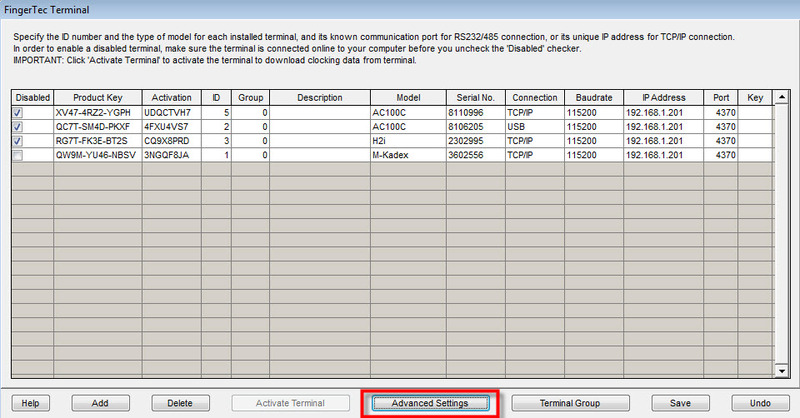 2) In Advanced Settings, click Get Settings to download the terminals’ information. 3) Change the new admin card number at the ‘Admin Card Number’ column. 4) Once it is done, click on Set Settings and the new card will be reflected in the terminal. Now you can proceed to set the terminal settings using the new Admin Card. 1) Add the terminal to Ingress and enable the device. 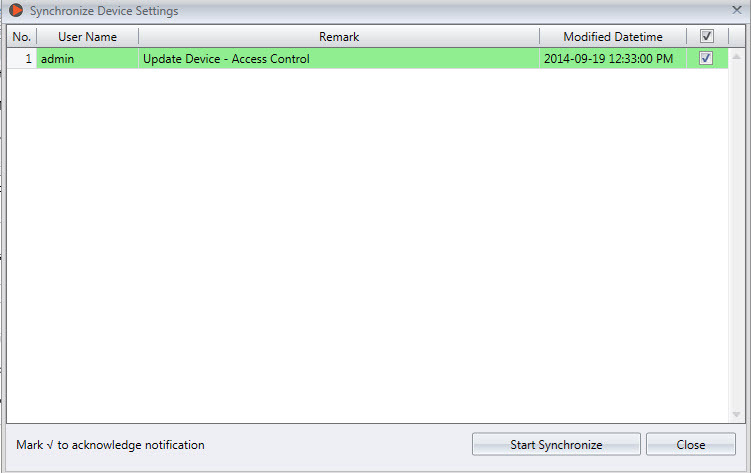 Once it is enabled, click once on the device name > Select the Access Control Tab and Click Edit. 2) At the Advance Options column, enter the new Adminstrator Card Num > Click Save. 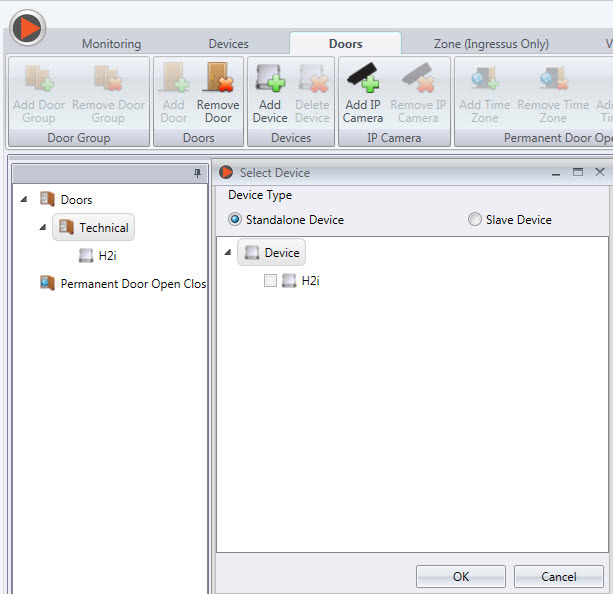 3) Go to the Door Tab > Create a door and add the device to the door. Note: Failure to do this will cause an inability to sync the changed settings to the terminal. 4) Once it is done, Sync the changes to the terminal and the new card ID will be reflected in the terminal. Now you can proceed to set the terminal settings using the new Admin Card. hola recientemente adquirí una lectora AC100C pero al encenderla ya venia configurada con un usuario de administrador, por lo que no puedo ingresar al menu de configuraciones estuve investigando y realice los procesos descritos en el manual de usuario del equipo pero aun no logoro restablecerlo a sus valores de fabrica, me podrian ayudar econ un metodo que conozcan. Please be informed that FingerTec support team is based in Malaysia. We are on 24 hours support to assist our customers mainly resellers for any technical issues. Please kindly provide us the name of your reseller or the serial number of the terminal in order for us to get your local reseller to assist you at the soonest. However, we are willing to assist you before your reseller reaches you. If you are using Ingress software please go to Devices > Select the device on the left panel > Select the "Others" on the right panel > Clear Admin Privilege.